I've never read anything by Marcus Sedgwick, the author of Midwinterblood, but I can assure he is on my "author radar" now. It only took reading through the first two chapters to know something was different about this storyteller. 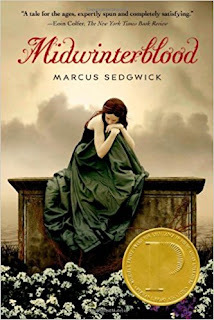 Sedgwick is a YA author, apparently, but I would not call Midwinterblood YA, unless you mean his books are for older high school students. Midwinterblood is dark, a bit historic, and is nothing like what you imagine from the first chapter. In fact, I almost didn't read past the first couple of pages of the second chapter, thinking it was another teenage romance novel. But that was when everything changed, and I definitely got the sense something was...off (in a very good way). By the way, while I'm a sixth grade teacher and always on the look-out for great age-appropriate books for my students, I also have a warped and wicked sense of humor sometimes, enjoy just the right amount of dark, and have a very open mind when it comes to what I read. I'm actually glad I didn't know anything about the book before I read it (there was only reviews on the back of the book, not a synopsis). I think I enjoyed it more because of that. So, how do I give you a bit of a book review without spoiling anything? I know the book isn't for middle school students, but I also know some adults that may not appreciate the author's type of storytelling. If you'd like to read something dark and haunting, but...soulful and thoughtful. If you have a mind that is open enough to enjoy the possibility that the world may not actually work the way most people think it does and enjoy a good twist and turn (or a few) that you don't see coming, this book is for you. It isn't a long book, it was a fairly quick read for me, but it definitely has depth...and superstition...and mystery. I really liked it. And I liked it even more after I finished it and absorbed the novel and appreciated the craft of the author. It is the year 2073. Eric, a journalist, is on a plane heading to Blessed Island to find out why people are so happy there. Other journalists have been sent to this 'utopian society' before to research it and tell the secret of what makes the island so wonderful, but they never return because they love it so much they stay there. Eric is determined to get the truth of what is going on at the island and tell it to the world. He arrives safely,...but is he safe?